Sweeney, Diane and Mausbach, Ann (2018). Leading Student-Centered Coaching. Thousand Oaks, CA: Corwin Press. To purchase, visit Corwin. With a focus on the critical role of school leadership, this action-oriented guide provides the key ingredients for ensuring the success of school-based coaching initiatives. Sweeney, Diane and Harris, Leanna (2016). 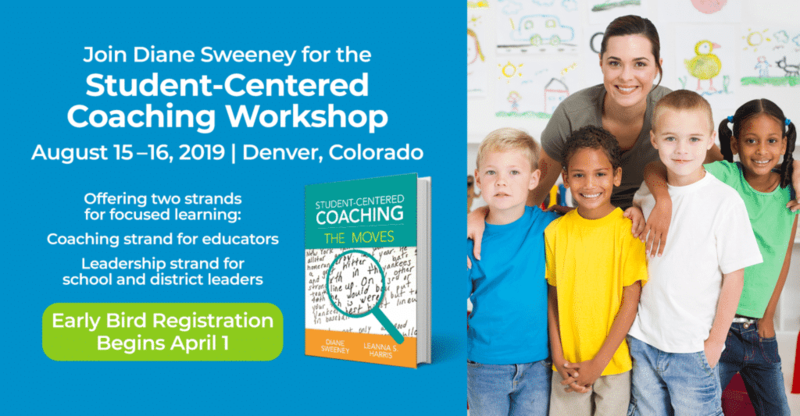 Student-Centered Coaching: The Moves. Thousand Oaks, CA: Corwin Press. To purchase, visit Corwin. This book serves as an extension to Diane’s previous Student-Centered Coaching books by targeting the micro-level practices that are used within and across coaching conversations. While the content for this book is based upon the framework and core practices that are outlined in Student-Centered Coaching and Student-Centered Coaching at the Secondary Level, it takes the practices further by providing the reader with specific coaching moves that they can use before, during, and after a lesson. The book includes video clips of coaching conversations and is accompanied by an E-Course provided by Corwin. Sweeney, Diane (2013). Student-Centered Coaching at the Secondary Level. Thousand Oaks, CA: Corwin Press. To purchase, visit Corwin. Written for coaches who work with secondary teachers in all content areas, Student-Centered Coaching at the Secondary Level offers rich case studies and practical tips and tools. Coaches and administrators get real-world specifics: Core practices for tackling the unique challenges of coaching across a variety of content areas at the secondary level; Extending coaching to teams of teachers, rather than just individuals; Using standards, such as the Common Core, to coach toward specific goals for student learning; Embedding formative assessments into coaching conversations; Moving past teacher resistance; and, Working in tandem with principals to ensure that coaching accomplishes the goal of increased student learning. With graphic organizers, planning matrices, and other valuable resources, this step-by-step guide is your ultimate road-map to coaching success. By focusing coaching on student learning—rather than on fixing teachers—you can make a measurable impact on student achievement. Sweeney, Diane (2011). Student-Centered Coaching: A Guide for K-8 Principals and Coaches. Thousand Oaks, CA: Corwin Press. To purchase, visit Corwin. Student-Centered Coaching is grounded in a simple but powerful premise: school-based coaching can be designed to directly impact student learning. When the focus is shifted from “fixing” teachers to collaborating with them in designing instruction that targets student achievement, coaching becomes both more respectful and results-based. The book also underscores the critical role of the principal in developing systems and structures for supporting teacher development and fostering a culture of learning. Each chapter includes: A model for designing and implementing student-centered coaching; Data-driven coaching tools and techniques focused on student learning; A framework for measuring the coaching’s impact; and, Specific practices for leading a student-centered coaching effort. Also included are exercises designed to promote coach and principal collaboration, giving them essential tools for enhancing student achievement. Sweeney, Diane (2009). “Student-Centered Coaching”. Seen Magazine. Vol 11.3, 90-91. Sweeney, D.R. and Harris, L.S. (2008) “Learning to Work With—Not Against—a System.” Published in Creating a Culture of Professional Learning, an NSDC Compilation of Articles and Newsletters from the Journal of Staff Development. Sweeney, Diane (2003). Learning Along The Way: Professional Development By and For Teachers. Portland, ME: Stenhouse. Sweeney, Diane (2006) “Mirror, Mirror, in the Lab.” Journal of Staff Development 28, 1: 38-41. Sweeney, D.R., and Harris L.S. (2002) “Learning to Work With—Not Against—a System.” Journal of Staff Development 23, 3: 16-19. Join authors Diane Sweeney and Leanna Harris for this two-day workshop.